1st Mythos Pack in the Forgotten Age has been announced! Would Arcane Research only work when 'upgrading a spell?' I couldn't pick up Mind Wipe with it? Even if I could, if you reduce the xp cost of a card the minimum cost of replacing a card in your deck is still 1 xp so it wouldn't actually be any cheaper right? The Devil's in the details, I hadn't realized Arcane Research was limited to upgrading a spell. "When purchasing a higher level version of a card with the same title, the investigator may choose to “upgrade” that card by paying only the difference in experience (to a minimum of 1) between the two cards and removing the lower level version of the card from his or her deck." So, it could go either way. I think that the minimum cost is 1XP, and then the effects of Arcane Research is added. However, you raise a really good case. In defense of my preferred ruling, I would offer Adaptable as a case where the card supersedes the Spending XP rules. It specifically says upgrade, so I assume it's for that specifically. I also assume that there's going to be some caveat that permanents can't be included with starting decks since they are lvl 0 cards. I think you could reduce the cost to 0 if you were upgrading from a lvl 0 spell to a lvl 1 spell. or a lvl 1 to a lvl 2. To be fair though, you don't 'upgrade' cards when swapping out cards with adaptable, so the technical limitation in the upgrade rules wouldn't apply. Page 5: When purchasing a higher level version of a card with the same title, the investigator may choose to “upgrade” that card by paying only the difference in experience (to a minimum of 1) between the two cards and removing the lower level version of the card from his or her deck. Upgrading is only when you're replacing a lower level card with a higher one. I do think the minimum 1 cost will still apply though, as nothing in Arcane Research explicitly overrides it. At least at the moment we don't have any spells where it matters, though. On a more general note, is it just me or is the quality on these articles actually getting worse? That's a tough bar to be sure, but they literally just copy-pasted the text of the card in multiple places. I'm long past expecting any meaningful insight from FFG's announcement articles but come on, is it too much to ask that these things be done by someone who knows a little more about the game than the intern's dog? I missed the nuance on upgrading versus adding. Thanks for bringing that up. I really like Arcane Research, that power at a price is spot on for Mystics. I guess the upgrade of the Archaic Glyphs doesn't work because the level 0 isn't a Spell, even if the Level 3 versions are Spells. Yeah, just because of the limited targets for the permanent, I'm not sure how valuable the card is. It LOOKS great on paper, but unless you are running more than a couple of these particular spells, a trauma is a hefty cost to save 1 or 2 experience. Particularly in the class that you can just run Delve too Deep. I know that I don't always take Scrying, blinding light, or upgraded ward of protections. And if you are running a half-mystic like Sefina, you're going to get limited use for upgrading cards like shriveling that you might want to upgrade in increments (she can only use up to lvl 2 spells anyway. I'm most intrigued by the mention of the "Vengeance X" enemy keyword on the story Ally pictured in the article. I haven't played Path to Carcosa, but as far as I know this is a new rule. Perhaps it will be something that penalizes you when the monster is killed, encouraging you to evade the enemy instead of fight it? I've always believed that the main reason killing enemies is generally preferred to evading them is because many enemies have harmful effects while they remain on the board (Whippoorwill, Wizard of the Order, Hunters, etc). A mechanic that challenges that conventional wisdom would be most welcome. unless you are running more than a couple of these particular spells, a trauma is a hefty cost to save 1 or 2 experience. I think it's more than that. Even if you just assume upgraded Rite of Seeking and Shriveling, you can potentially get 6 XP out of those. Shriveling alone will let you get the L5 for 3 XP if you're willing to take the slow road. The one per scenario is going to be a bigger limitation than the range of things to spend it on. I'm most intrigued my the mention of the "Vengeance X" enemy keyword on the story Ally pictured in the article. I haven't played Path to Carcosa, but as far as I know this is a new rule. Perhaps it will be something that penalizes you when the monster is killed, encouraging you to evade the enemy instead of fight it? I've always believed that the main reason killing enemies is generally preferred to evading them is because many enemies have harmful effects while they remain on the board (Whippoorwill, Wizard of the Order, Hunters, etc). A mechanic that challenges that conventional wisdom would be most welcome. I think it's for enemies that aren't defeated. That if they're in play with the scenario ends, you get fewer XP. Well ask it this way, would you be willing to take mental trauma on a 8 or 9 Sanity investigator if it gave you 7 xp. In general, I would say yes. Thats about +25% xp for a campaign. Throw in some side scenarios and the numbers change. Now its not that simple, you need to have a solid upgrade plan that ensures you have enough XP to upgrade one spell each time. I mean you could do Shriveling, Shriveling, RoS, RoS, Shriveling, Shriveling and still upgrade one of your wards of protection to l2. To be clear this changes a 19xp investment into a 13 xp investment. I could do a lot with those extra 7 xp over the course of a campaign. Recharge looks pretty good in this case or heck I am one xp short of 2 grotesque statues. Also, Delve to Deep AND Arcane Research can really add some serious dividends. Just make sure Yorrick is on your team and Jenny brings her medallion. I'm not saying it's bad, just that there are quite a few limitations. I can't imagine a mystic that wouldn't take upgraded shriveling, for example, but if for some reason these cards are not what you want, it may not be worth the investment. For instance if you are running a combat light resource cheap deck and prefer to take Song of the Dead. It only has one version of the spell, so it's not an upgrade and wouldn't benefit. Still a fun card to play around with though. In order to gain the experience discount from Arcane Research, you must be upgrading a card with the Spell trait. You would not get the experience discount if you are purchasing a newSpell, nor would you get the discount if you are upgrading a card that does not have the Spell trait (even if that card would upgrade into a card with the Spell trait). Additionally, the minimum experience cost for upgrading any card is always 1 (see “Experience”, RR page 5), so you would need to be paying 2 or more experience in order for the discount to apply. Thanks Donel. That clears that up. I don't think we have any 1 experience gap spell upgrades at the moment, but I'm sure we might one day. Now we need to know if you can include a Permanent at the beginning of a campaign, thus avoiding the cost of "purchasing" it. You can. (Apart from there being nothing to prevent it in the rules for Permanents, Matt confirms it in the same email response that provided the above, which someone helpfully posted to the FB group). I would think that is why there is a tade-off for both mentioned. In the one case, it is a trauma, and for the other seeker card it is the random factor of what your 2 identically named cards are going to be/do. Fair enough; just wondering if they will be staple cards for classes since they don't take a card slot being permanent and all. Kinda not sure I want to see cards that are so prevalent and don't have prominent enough trade-offs to be optional. They almost seem like an auto-include at first glance... I'm on the fence about them. They sure are interesting as an addition though. Fair enough; just wondering if they will be staple cards for classes since they don't take a card slot being permanent and all. Kinda not sure I want to see cards that are so prevalent and don't have prominent enough trade-offs that they don't seem optional. I'm on the fence about them. They sure are interesting as an addition though. Maybe there's something in the email I'm missing (I'm not on FB). But if you can take the card at the beginning, you're not purchasing it, right? So you don't take the penalty? 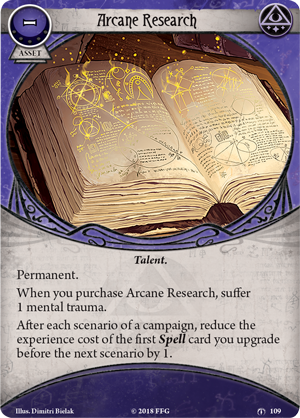 So everyone who can take this card can just be assumed to have it (except the ones who would have to give up a slot for it -- Norman and most of the Dunwich crew) and the penalty is moot? Maybe there's something in the email I'm missing (I'm not on FB). But if you can take the card at the beginning, you're not purchasing it, right? So you don't take the penalty? So everyone who can take this card can just be assumed to have it and the penalty is moot? I have to believe you take the penalty even if you start with it. Otherwise, why write anything about a cost at all? Everyone would just take it at start and thats boring. Can you confirm that again Buhallin? Seems weird for reasons I stated above. It seems like it should be worded as "When you add this to your deck". I've never thought of the initial deck build as purchasing, and the rules never call it that. Where are you seeing that you can add zero level permanent cards to your deck at the start of the game in that email? The permanent keyword doesn't say anything about not being able to be included at the start in the first place. But I think you should still have to pay for the mental trauma.